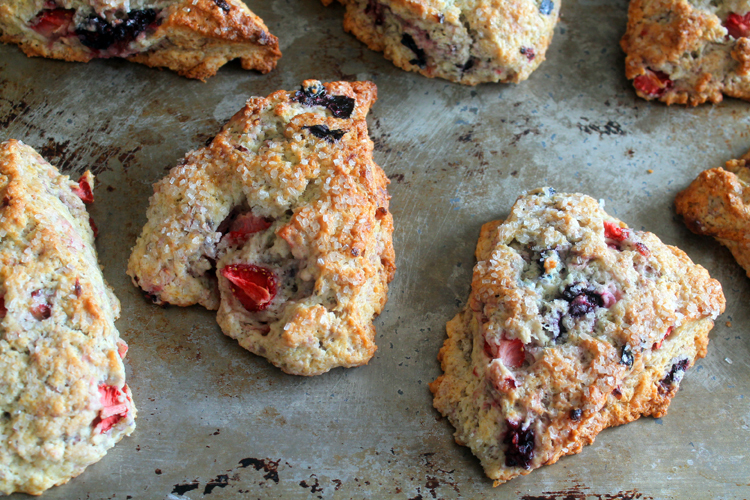 Mixed Berry Mascarpone Scones are sweeter than sweet, with a delightful “cream tea” flavor to them that can’t be beat. Mascarpone makes them wonderful. You know how sometimes you get an idea in your head and it just won’t go away? 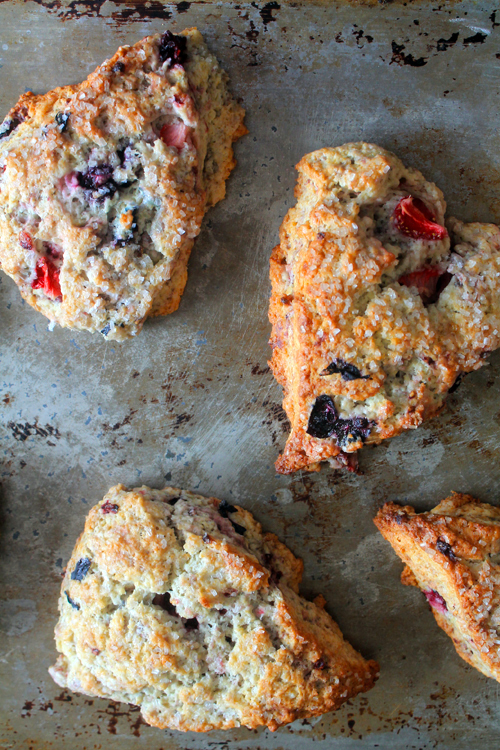 That’s where these Mixed Berry Mascarpone Scones come from. You see, I have a toddler now. And he eats a LOT of fruit. But sometimes I over-buy accidentally, and that fruit starts to spoil before he can eat it all. Especially berries. And because I’m not so smart sometimes, it didn’t occur to me that I should eat the berries until they were on the cusp of not so greatness. Armed with those softening blackberries, raspberries, strawberries and (sigh) blueberries, I knew I had to bake something, and bake something quick. I’m also having a love affair with mascarpone right now. During my childhood, we never experienced mascarpone. I think the first time I had a cannoli was in high school, at some school-sanctioned restaurant trip, and simply had no idea there was actually cheese in the middle of that sucker. If you’ve never had mascarpone before, to me, it tastes and feels the same way heavy cream does to your tongue – only in a more solid form. Then my friend Megan made Mascarpone Pancakes for Food Fanatic, and we became completely enamored with them around here. They’re one of Evan’s favorite breakfast foods. So we suddenly had spare mascarpone kicking around pretty much all the time. It’s not a bad problem to have. These scones went through a few iterations before this current recipe. In case you were wondering, when baked in frozen chunk form, mascarpone does, in fact, still melt. It also takes on a much “cheesier” taste than it started with. Not what I wanted at all. So I backed off a bit, and just used mascarpone in the liquid portion of the scones. I just kept makin’ ’em until I got it right, because I was obsessed with the idea of mascarpone in scones – and you should be too. What comes through is exactly what you wish a scone made with heavy cream would taste like. It’s got that heavy, decadent mouthfeel that keeps you going back bite after bite. Paired with berries, it’s like the most magical tea time treat you can imagine. That’s why I just had to serve them up today for my sweet friend Christina’s virtual baby shower. Christina and her hubby are expecting a darling little girl they’ll call Camille. How could she be anything but lovely with a sweet name like that? Evan and I cannot WAIT to meet Miss Camille, and hopefully someday give her a few kisses and cuddles too. In the meantime, we’re celebrating her mama the way any good Texans would – with lots of good food and fun stories. Christina, I know that you will be the most attentive, loving, generous mama. You’ll raise that baby right, with bacon and refried beans on occasion, and you’ll make sure she’s got at least a few pictures taken in Bluebonnet fields as she grows up. She is so lucky to have you and B as parents. 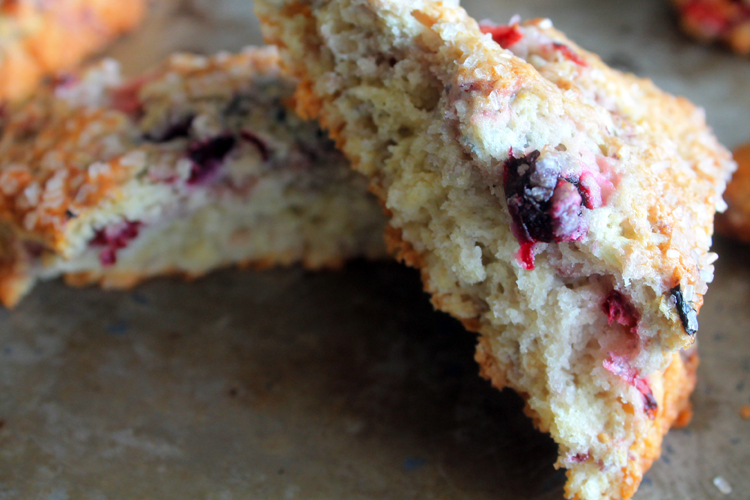 Mixed Berry Mascarpone Scones make an excellent breakfast or afternoon treat. Hello, gorgeous! Preheat oven to 400°F. 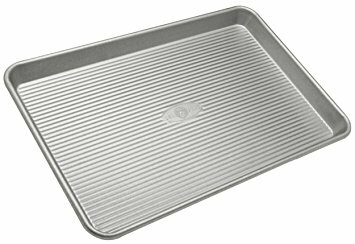 Line a jelly roll pan or cookie sheet with parchment paper. In a large measuring jug, whisk together egg and mascarpone until it becomes a cohesive liquid. In a large mixing bowl, combine flour, sugar, baking powder, kosher salt, and baking soda together. Whisk thoroughly to combine and aerate. Chop fresh mixed berries into bite sized pieces – use any mix of berries you like. When you have enough to fill a 1 cup measure, add them to the flour mixture and stir gently so that they’re mixed throughout the flour, and well covered, but not crushed. Using a coarse-sized cheese grater, grate frozen butter directly into flour-berry mixture. Toss gently into the dough so the butter shreds are well distributed. Add mascarpone-egg mixture into the bowl. Begin to mix dough together with your hands, a dough scraper, dough whisk, or gently with a rubber spatula. Your hands will work best. 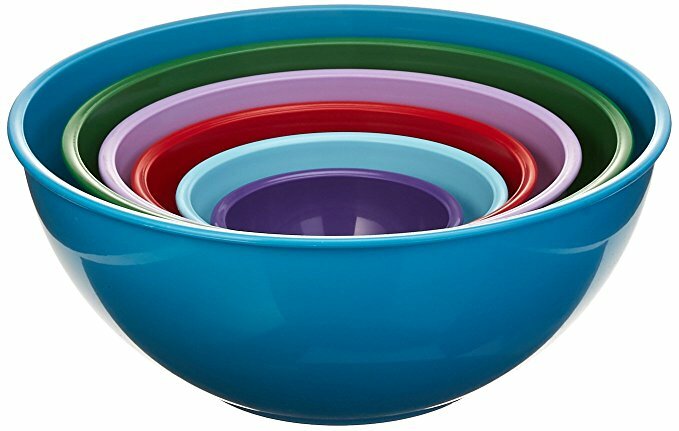 Knead the dough against the side of the bowl, pressing gently to bring the dough into a cohesive dough. If you find that the dough is too dry, add half and half a tablespoon at a time, kneading after each addition, until your dough can be formed into a firm, round dough ball. Place the dough ball onto your prepared baking sheet. Press and flatten the ball until you’ve got a disk about 1" thick. Use a sharp knife to carefully slice the disk into 8 triangles of roughly equal size. At this point you have two choices; you can leave the triangles together, and you will have softer, more doughy scones (and they may take slightly longer to bake), or you can pull the triangles carefully apart, and arrange them on your baking sheet so that they’re about 2" apart. Do this if you prefer a scone with crispy edges. Sprinkle each scone with sparkling sugar if you are using. Bake for 18-22 minutes, until the tops and sides are beginning to turn golden brown. Allow to cool on the baking sheet for a few minutes, then move to a cooling rack to finish. The half and half is listed for if you find your dough too dry. You may need it if your berries are super fresh and not very juicy. The more ripe the berries, the less extra liquid you will need, or not any at all. Add half and half a tablespoon at a time to bring your dough together. Do not add too much! I would not suggest using frozen berries in this recipe, as you will not fully know their liquid content until after they’ve cooked, which could result in a goopy, floury mess of scones. These scones will keep in an airtight container for up to 3 days. I love using ricotta for scones, but never thought of mascarpone. 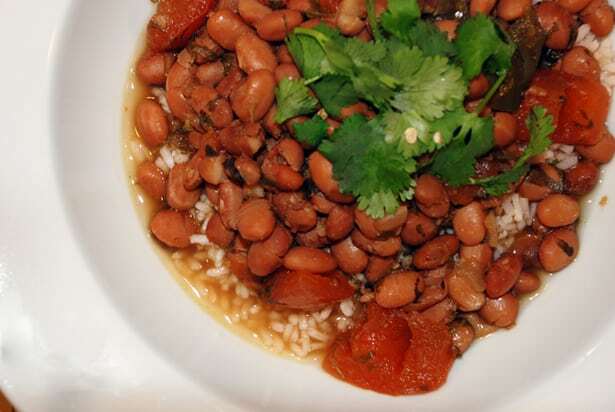 Thanks for getting this recipe just right for us! OMG these look so good!! I’m currently swooning over mascarpone as well since I never had it as a child either! Too funny 🙂 These scones look to die for and I definitely want to give them a try. So fun doing this shower with you! Oh I love these! I have a feeling they’d disappear quickly in a real-life shower. 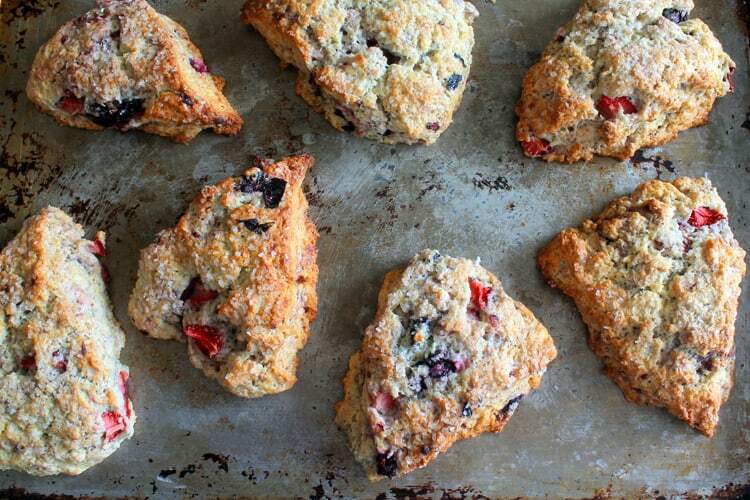 These scones sound absolutely amazing! Like yummmmmmm! Love the stories about your toddler and berries, one of my best friends has a little girl and she too always buys tons of berries for her girl, sometimes they are about to go bad and we look for recipes, so I’m totally going to send this link her way 🙂 What a sweet post for the baby shower! Oh, Amber. Where do I even start?! First, THANK YOU for this sweet post. But mainly, THANK YOU for being you. For being my sweet friend. Who gives me great baby advice. And calms me down any time of day. I smiled so big at that bluebonnet comment, because you know it’s true! I love ya to the moon and back! So…when do we start planning Camille + EJ’s wedding?